Mapumental can turn vast datasets into visual tools that everyone understands. Faced with highly complex, yet crucial data from the Fire Protection Association, we had a chance to really put our technology through its paces. Just how quickly could fire engines reach a given postcode in case of a fire? It’s a question that’s pivotal to decisions made by both the emergency services and the insurance industry. But previously, it has been a challenge to present the data simply, because it involves so many variables. Every region has its own factors, each of which will impact on fire engine response time. 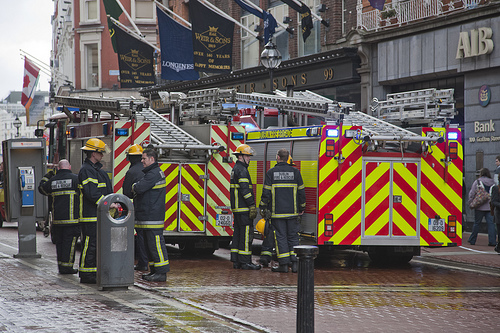 The number of vehicles at each station, the hours during which the station is manned, and the response policy of each individual fire authority will all play a part – and that’s before you even consider how geography might affect things. Dr. Jim Glockling is Technical Director at the Fire Protection Association and Head of the Risk Insight, Strategy and Control Authority (RISCAuthority), an organisation for the advancement of risk management within the fire and security sectors. Jim approached mySociety with this question: how could we map this crucial, yet complicated data in a way that could be understood by RISCAuthority members at a glance? It was clearly a job for Mapumental. Our transit-time mapping software was originally built to visualise public transport journey times, but its beauty is that ‘layers’ of data can be swapped out, allowing it to be used for all kinds of purposes. Read more about mySociety’s data visualisation services here. How quickly could 4 fire engines get to AL10 0XR ? How does that change if the severity of the fire just requires one fire engine? A user inputs a postcode, and can assess exactly how quickly a fire could be tackled in that area. The different levels of severity are measured by how many response vehicles are required, and changes in this number are immediately reflected on the map. Which areas can four fire engines get to within 9 minutes 30 seconds at midday on a Saturday? It’s also possible to assess the region’s overall response capability, without inputting a postcode. The user sets severity levels (number of fire engines, or High Volume Pumping or Aerial Appliance (ladder) is needed), the time and day of the week. Where can an aerial appliance get to within 15 minutes at 2am on a weekday? The FPA tool immediately highlights the areas that are accessible within the chosen parameters, drawing on the underlying data of journey times and information such as vehicle numbers and hours of operation for each individual fire station in the region. With RISCAuthority, we tested the concept using data from one fire authority – Hertfordshire. mySociety’s task was to create a usable, elegant web interface that was as simple as possible to use, while still giving insurers the key data they needed. The project called on everything we knew about clean design, usability and data structures. A key part of what makes Mapumental’s data visualisation so intuitive are its sliders: this enables the user to quickly explore variables on a map. The pilot tool was well received by the FPA community, and the plan is now to work with RISCAuthority to roll it out to more fire authorities shortly, and then nationwide. Would they get buy-in from both insurers and Fire and Rescue services on the viability and usefulness of the project? Was it possible to present such a massive amount of data in a format that was readily palatable to the intended audience? During this phase, we will be inputting still more detail to the data, including information on the types of fire engine available to each region, and the plotting of fire stations on the map. The tool will be a valuable resource for the FPA and the insurance industry, and we really look forward to the roll-out later this year. Mapumental specialises in visualising complex geographic data sets on intuitive, easy to use map tools. If you have a data visualisation project that will benefit from Mapumental, just get in touch. Or read more about mySociety’s data visualisation services here.